The skyscraper technique is simple. You create the most-detailed, informative, and downright phenomenal piece of content in your niche. Your aim is to make it the definitive resource on something. A blog, infographic, or video that is better than anything else out there. The tallest skyscraper in the city. And you share it with everyone you know. Now, you can never guarantee that something will go viral, but this is about as close as you can get. Everyone wants to view and share the best content. Our flagship ‘skyscraper’ piece has 2,000 shares, and counting. There are plenty of others out there in the tens of thousands! The aim of skyscrapers is to find the best piece of content out there, and improve on it. You’re looking for proven content niches that are already generating lots of engagement. If you’ve found a piece of content that lots of people are talking about, imagine what will happen when you make that content even better. 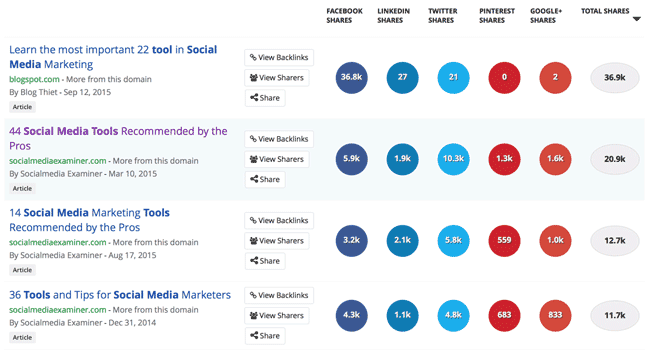 I like to start by using Buzzsumo. It’s a cool little internet tool that lets you track the most popular pieces of content online. Let’s input the phrase ‘social media tools’, and see what popular content is out there. As you can see, there are some big numbers here. 36.9k shares for the top post. This is a hot topic. It’s in demand. You can also Google your target phrase, and see what content is dominating the first page of results. It’s up to you to take that content, and make it better. Now, open up a selection of those top pieces of content. They will be at the top of their game, but there’s bound to be a weakness somewhere. In the case of our social media tools concept, there are a few ideas that come to mind. Firstly, there’s no piece of content newer than 6 months old. Social media and the tech world moves fast. 6 months is practically 6 years in internet years. So the first option is to curate a more up-to-date list. Secondly, almost all of these lists seem random and unorganized. They’re a great list of resources, sure, but perhaps we could break them down into categories. Maybe we could group them into social platforms etc. Make it digestible and more user friendly. Always look for that gap that you can fill. What is all the other content missing? If you’re going to create skyscraper content, you’ve got to really commit. There’s no point half-assing this one. The key to great skyscraper content is putting in the time. Better to spend a full day on this one piece of mega-awesome content than blast out five mediocre blogs. That means going the extra mile. 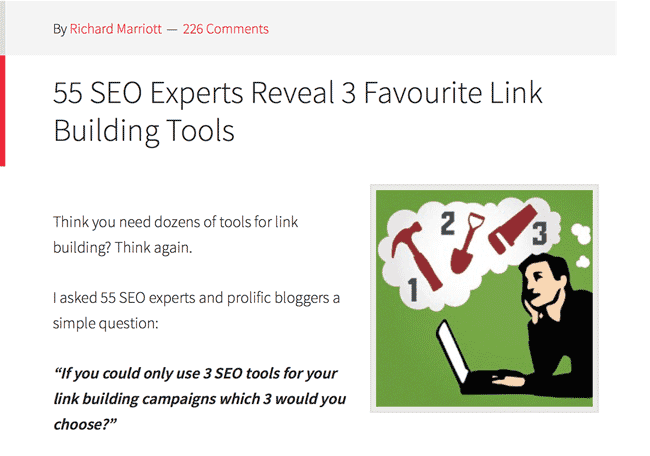 One phenomenal example is this piece by Clambr: 55 SEO Experts Reveal 3 Favourite Link Building Tools. Their idea to was to get all the biggest names in marketing to recommend their favourite SEO tool. They sent out over a hundred emails asking the experts for their favourite social media tool. They got tons of responses, and put it all into one super-authoritative blog post. Now they have a resource with input from the biggest names in the game. Smart. It’s the number one piece of content on Google for ‘best link building tools’, and it has tens of thousands of shares. It’s things like this that make something an ultimate resource. It takes your content above and beyond. Now that you’ve created your killer piece of skyscraper content, you need to find an audience. This is the hardest part of the process. Remember, this is a ‘skyscraper’ piece of content. It has to rise above all others. Not just in quality, but in reach. The concept behind this piece of content is to dominate Google search results, and outshine the other rivals. The tried-and-tested method of promoting a skyscraper is by sending an email out to the biggest influencers in your industry or niche. Look for anyone who has blogged about that topic before, and reach out to them. I recently came across your blog post on social media management. Loved the insight! I recently created a huge resource of social media tools, and I thought you might like to mention it in the post. If you reach out to 100+ bloggers, you should land a few great links back to your content. We all know that’s great for SEO, and great for traffic. One of the best skyscrapers online is Chris Gimmer’s piece: 17 Amazing Sites With Breathtaking Stock Photos. (Read the full story at Backlinko). He knew that his audience (web designers) all hung out in a hugely popular Subreddit. 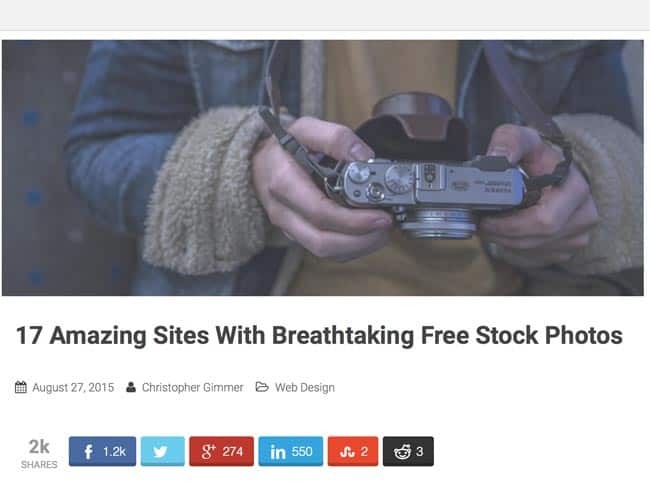 His first step was to post his content there, driving 17,000 visitors in a day. Find out where your main audience communicates, and target them! If that all sounds like a lot of hard work, you can always plough some money into advertising. It’s less organic and natural, but it still drives traffic. Content always responds really well on Facebook, so try a targeted Facebook ad campaign. Set your audience to people within your niche, and blast it out over a couple of days. It’s a great way to give it a head-start, and it will start to pick up tons of organic views off the back of your advert. The problem with skyscrapers is that someone will always come and build one higher. Nothing stays still for very long on the internet, so be prepared to dive back in and update your skyscraper post regularly. Otherwise, it will quickly become outdated. Another smart marketer will build upon what you’ve created, and make a stronger authority piece of content. Keep an eye out for new tools, information, and resources, and add them to your article. If you’re looking for an idea, think about your expertise and experience. What ultimate resource could you create?